These 1/3" CMOS Wireless Camera will send sound as well as video to the hand held LCD Receiver with an unblocked linear transmission distance of 500M, this 2.4G locked frequency camera transimitter and LCD receiver are ideal for those on the move. The LCD reciver has an internal re-chargeable lithium battery which when fully charged will provide over 2 hours usage. The four camera are equipped with microphone as well as infrared night vision with a distance of 10-15M. 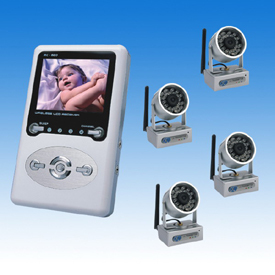 This wireless camera kit is ideal for monitoring activity in warehouses, offices and children's play areas because of the long 500M transmission distance.